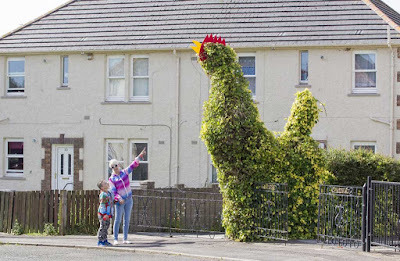 Pensioner Jim Hughes left his wife opened-mouthed with the gardening he did when she went on holiday and created a 14ft cockerel in the front garden of their home in East Wemyss, Fife, Scotland. The 73-year-old decided to turn his old cherry tree into something different as Moira visited her niece in Scarborough. He got up his ladder, trimmed the ivy-covered tree to make it look like the 14ft bird and then stuck pieces of red plastic on its head for its beak and a comb. 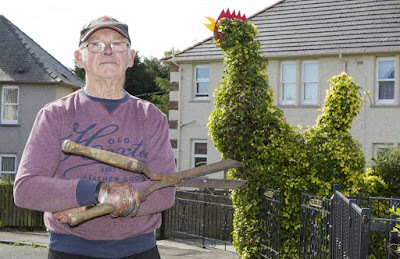 The transformation took grandad Jim just 30 minutes with a pair of shears and secateurs. 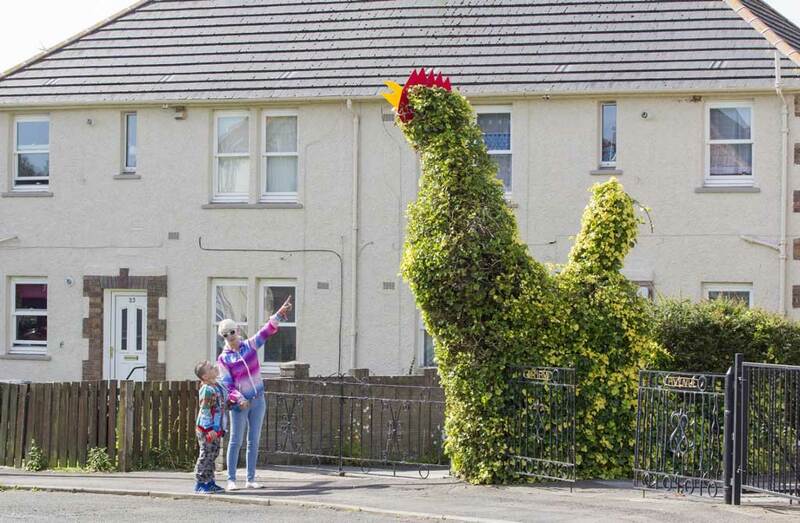 Wife Moira, 73, said she was stunned when she returned from holiday and spotted the massive cockerel in their front garden. She said: "I was away on holiday and when I came back it was like that. I know he was trying to make something but that was a surprise. People keep stopping to look at it. Quite a few have passed remarks and they think it's clever. I think we'll keep it. I don't really have a choice." 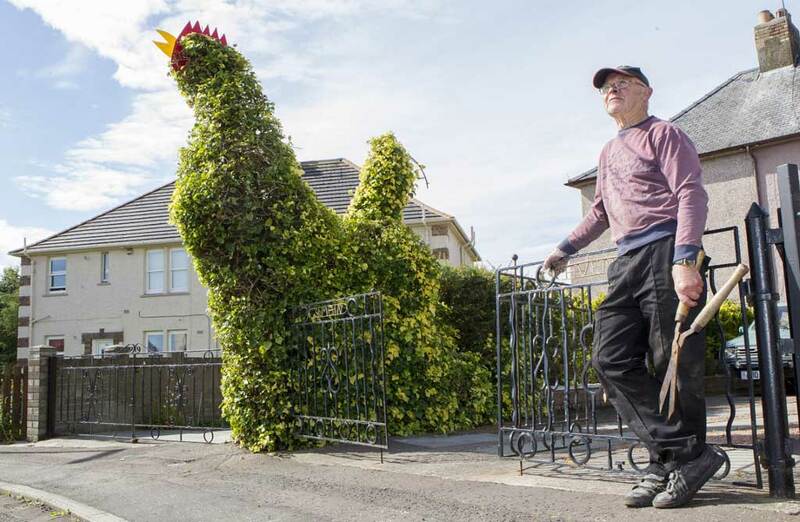 Jim says his cockerel has become a bit of an attraction with people stopping to take photos of it outside his home. He said: "Originally, it was an old cherry blossom tree. It got that big that I was worried it would be blown over and hit a car. The main trunk is from the cherry tree and ivy has grown up it. I cut it down and shaped it. I just shaped it like a cockerel and stuck pieces of plastic on top for a beak and a comb. It's at least 14ft tall so I had to use a ladder. "It's in the front garden and looks out into the street. "Since then, quite a few people have been stopping to take photographs. I call it Jock. And it's crowing for independence." Caroline Russel, 59, who lives next door, said: "At first I wasn't too sure what Jim was doing. But then we discovered he was turning the tree into a cockerel. It's big, really big. It's lovely and brightens the place up a bit. It's at the front gate and looks down the street. Jim's a very cheery guy and people have been stopping to look at his cockerel. My grandson is only two and he think it's very funny. It will stay as long as Jim's here." "And it's crowing for independence"